Home Home + Garden The Address: 215 Garrard St. The Address: 215 Garrard St.
Travel back in time to the Amos Shinkle House. 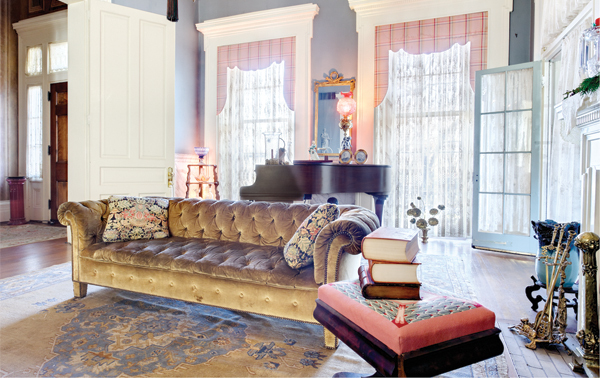 The best things about 160-year-old houses aren’t the detailed crown moldings, the original hand-painted wall murals, or even the ornate bronze chandeliers; the best things about 160-year-old houses are the stories. This Covington Italianate townhome’s story began in 1854, when it was built for millionaire entrepreneur Amos Shinkle. Credited with bringing gas street lights to Covington and founding the Children’s Home of Northern Kentucky, Shinkle is most famous for helping finance the Roebling Suspension Bridge. Although Shinkle lived in several Covington-area homes throughout his life, this one is thought to be the only one still standing. Flash forward 132 years; in 1986 devout Catholic, philanthropist, Kenton County Commissioner, and former Covington Mayor Bernard “Bernie” Moorman and his business partner, Don Nash, buy the place. The pair operated it as a bed and breakfast from 1986 until late 2010. “Both Don and Bernie cooked,” says caretaker Guy Lajeunesse. “They flipped flapjacks; it was a staple. People who lived in town would come and relax and enjoy talking to Bernie.” Don passed away in 2006 and Bernie died last spring at the age of 73. Restoration buff and Covington activist Julie Boudousquié listed it for sale shortly thereafter. Lajeunesse says legend has it that the carriage house out back, converted into four guest suites under Moorman and Nash, served as a hiding spot for runaway slaves. Back in the main house, the 16-foot ceilings and an iconic, awning-clad Southern-style side porch bring the first chapter of this home’s story to life. Its most recent chapter is amply illustrated by the uber-luxe master suite complete with giant four-poster bed, mirrored bath, and oversized sunken tub. Wonder what stories this house will tell in the next 160 years.